MEMBERS of West Inishowen History and Heritage Sociey took part in the first public unveiling of the lifetime collection of 20th century Derry archaeologist Mabel Colhoun last weekend. The event took place on Saturday as part of Archaeology Day, exploring local history across the city. Ms Colhoun's collection comprises many discoveries by the "city’s trailblazing 20th century female archaeologist" and includes historic photographs from Inishowen and Derry, prehistoric artefacts from local sites and exotic jewellery from ancient Egypt, Greece and Rome. 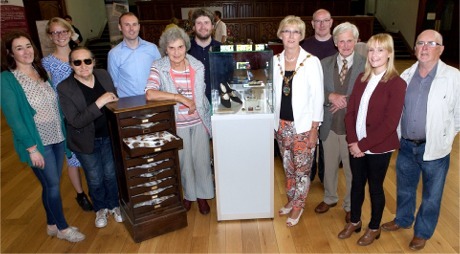 Derry Mayor Hilary McClintock joined Kyleen Clarke, niece of Mabel Colhoun, for the unveiling of her lifetime collection at the Guildhall as part of Archaeology Day. Included from left are Roisin Doherty and Annie Casey, Derry City and Strabane museum services; Mari McLaughlin, Liam Gorry, chairperson, West Inishowen History & Heritage Society; Ronan McConnell, museum services and, from right, are John Hegarty, Denise Henry, guest speaker, Richard Clarke and John McLaughlin.